IBM InfoPrint 6500 V10 printers (cabinet model) attach to a wide spectrum of IBM systems — from IBM mainframes and parallel servers to PCs. Meet the demands for efficiency and manageability in high-volume environments. 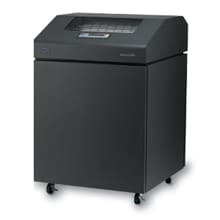 The IBM InfoPrint® 6500 v10 line printer with ribbon cartridge technology is built to adapt rapidly to changing business environments. The printers now come with “ribbon minding” technology wihich tells you at all times how much ribbon life is left, cutting waste as well as cost. With a state-of-the-art print engine and controller technology, you can confidently meet the demands of back office,data processing and supply chain applications. Powerful remote management capabilities help to maximize printer utilization.